Paul Spain and Damien O’Carroll visit Ford’s Research + Innovation Center in Silicon Valley, meet the CEO and learn where transport tech is headed. Also included are chats with Ford guests Reddit Co-founder Alexis Ohanian and Getaround’s Padden Murphy. 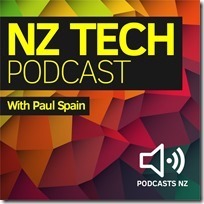 This NZ Tech Podcast hosted by Paul Spain (@paulspain) and Damien O’Carroll. Published by NZ’s Podcast specialists – Podcasts NZ.